A little over a year ago, my husband and I went on our month-long European honeymoon, with absolutely no itinerary or agenda. We only knew of our arrival and departure date which some people might cringe at the thought of not knowing where you’ll stay or what to do while on vacation; however, for my husband and I, spontaneous traveling is our favorite. 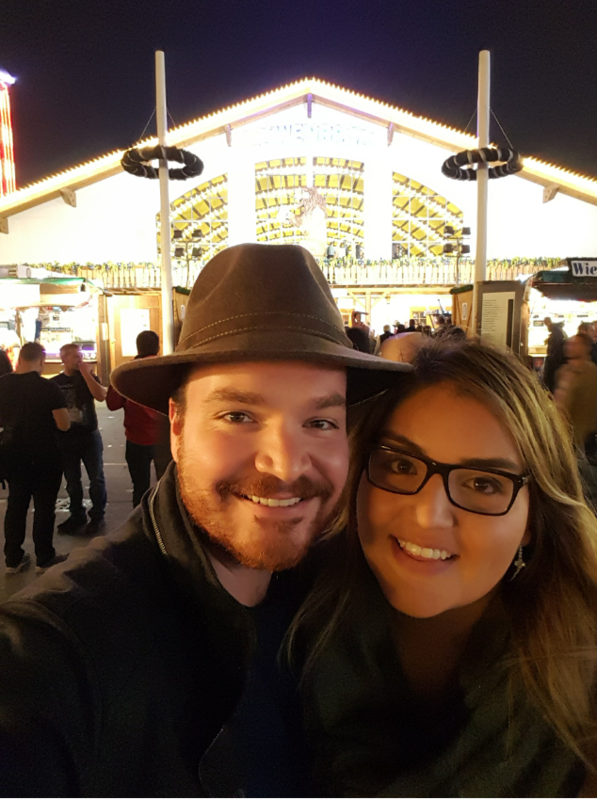 Thanks to our spontaneity, we were able to pack our bags and jet off to Munich, Germany to attend the 2017 OKTOBERFEST celebration – the world’s largest “Volksfest” (German for “people’s festival”). Many of us have probably experienced some sort of “Oktoberfest” celebration, whether it be at a local town, bar or restaurant, but (let me tell you something) the real Oktoberfest in Munich is something extraordinary. Why, you ask? Imagine walking into the largest carnival ever. As you walk around and see everyone dressed up in lederhosen and dirndls, traditional Oktoberfest outfits for men and women, respectively. You make your way through the crowds and eventually end up in one of Oktoberfest’s several popular “beer tents” which is full of people dancing and singing on tables, drinking beers from giant steins, eating giant pretzels, listening to live music and so much more! As you continue through the carnival, you can’t help but notice several kiosks selling heart shaped German gingerbread cookies named “Lebkuchenherzen” which have different phrases iced on them such as “Ich Liebe Dich” (German for “I LOVE YOU”) or “Oktoberfest 2017.” I noticed that people wore these around their necks, several at a time, almost as if they were German gingerbread cookie medals. My husband and I of course bought a few and hung them around our necks, wearing them proudly and enjoying the total Oktoberfest experience. Now, fast forward to a few weeks ago when Oktoberfest decorations started creeping up at grocery stores and restaurants. I instantly knew I had to bring up the idea of hosting a Shift OktoBEERfest party for the West Coast Office. It didn’t take much convincing to get the green-light before going into total party planning mode. I knew we needed two key elements to really capture the spirit of Oktoberfest: German music and someone dressing up in a traditional lederhosen outfit. To cover the music, I naturally did what any millennial would do (with the help of Spotify) and I created a playlist full of traditional German Oktoberfest tunes to really set the tone. Thankfully, I had no problem finding an employee enthusiastic about the opportunity to sport the lederhosen outfit. 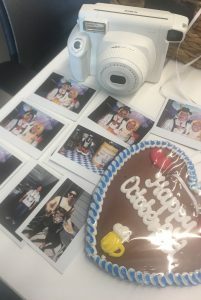 Since we had the “feel” for Oktoberfest nailed down, it was time to address how to provide German food and drink; we needed to have a variety of pretzels, bratwursts, BEER and desserts. I personally made a traditional German beer cheese dip called “Obatzda” and, to be honest, my homemade cheese dip turned out finger-licking good! As for the German beer, I luckily scored a few “Hofbrau Munchen” Oktoberfest mini kegs imported directly from Munich, Germany which serves the same beer found in one of Oktoberfest’s “beer tents.” Talk about bringing the real Oktoberfest beer, one mini keg at a time! true fashion, wore them around their neck while enjoying their food, beverages and games. to Shift’s West Coast 2018 OktoBEERfest celebration. Prost, everyone! Till next time, auf wiedersehen.